Takethe5th has been following the Apple versus Adobe debate with a bit of a jaundiced eye – wondering how Flash video and all its broad range of applications can run so fast on Windows yet slow on Macs [and Linux too]. Adobe claims that the latest Flash player 10.1 has not been tuned quite yet and the Mac OS graphics accelerator APIs have not been available to Adobe developers on a timely basis. And Apple and Steve Jobs bemoans the fact that Flash is too slow, insecure, buggy and without explicitly saying so – a piece of software crap. However, a recent report in Engadget caught my eye. It point to a comparison of MacOS/X vs Windows 7 vs Ubuntu 10.04 done at Phoronix measuring the graphics performance of the 3 popular OS on what can be nearly the same Apples and Apples basic computing hardware – its always a Mac Mini platform. In fact Phoronix has taken pains to do so. The results [see one of several charts above]are most interesting and applicable to the Apple vs Adobe debate. 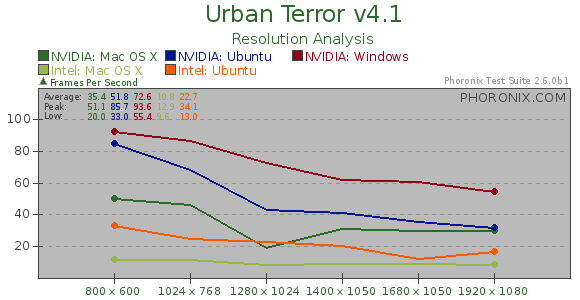 In 4 different tests over 6 popular resolutions [from 800 x 600 screen to HDR 1920 x 1080] Windows 7 running on the NVidia graphics hardware beat both MacOS/X and Ubuntu consistently – even when the graphics accelerators were changed. Now consider this – Windows 7 was never beaten and the margin of victory was 30 to 300% better than Apple. Even more intriguing Ubuntu Linux, though never besting Windows 7 , also consistently outperformed Apple MacOS/X. So this raises a legitimate question – was Steve Jobs dissing Adobe Flash performance to distract attention from Apple’s own very poor graphics performance? With graphics performance on Macs 30-60% slower than Windows, wouldn’t Flash video inevitably run slower on Macs [and Linux too]? Phoronix is promising more benchmarks with other graphics software after its May 2010 posted results. I hope they include Flash Player 10.1. Here is one party that will be watching.